I was born in Brindisi in 1974 but almost immediately the whole family moved to Rome’s surroundings, the Castelli Romani, of which I still remember the smooth and curvy hills overflown by those big Piaggio P166. For some years I have also lived in Jacques Brel’s “plat pays”, Belgium, where I fell in love with flying (something, without any doubts, also favoured by some holidays spent in UK). After the usual “diet” made of books, magazines, VHS’s, kit models and an aviation culture course organized by the Italian Air Force for the benefit of high school students, I make the big step into real aviation thanks to my father who some day in 1991 brings home a leaflet depicting a gliding club located on Namur-Temploux aerodrome. 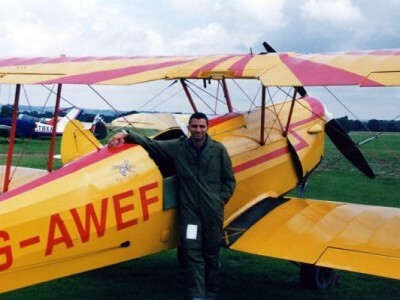 The same Summer I earn my glider wings while I have to wait until 1996 to start my PPL, commenced in Tuscany (together with skydiving) and ended in Puglia. The following years I also get my microlight pilot licence and microlight instructor rating. Since the beginning I have been fascinated by historic aircraft, first of all while soaring among the scripts of Clostermann, Kingcome, Richey, Wellum and Bach too and then by going to Headcorn’s The Tiger Club three Summers in a row to be checked on the DH82A Tiger Moth, SV4B Stampe (for my aerobatic rating) and Druine D31 Turbulent (at the time I also wrote another couple of articles: on the SF260 and Sikorsky SH3D). My next goal? Just to pursue what seventy years ago was the training process followed by those RAF old boys, i.e. settling an intimate acquaintance with the North American T6 (and why not with a Stearman too?) dreaming, some day, to fly that hot-tempered Spitfire!